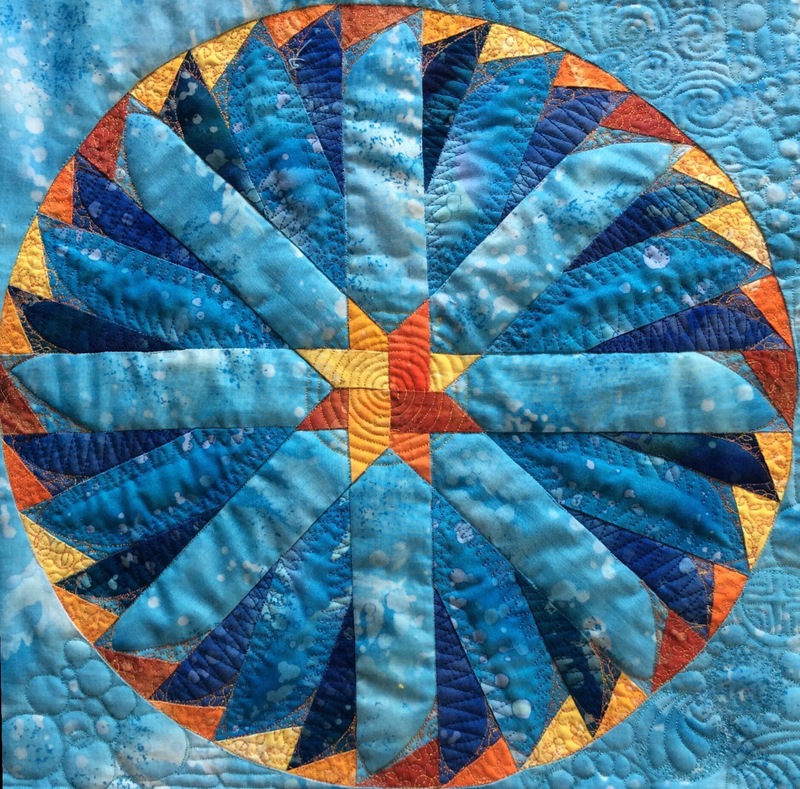 Today is World Quilting Day and I am guilty of having done no quilting at all! To make up for it, I will share the two flower blocks I have recently finished from the Dreamcarcher Round the Year Quilt. These are from one of the five quilt-as-you-go panels that will be joined to make the full quilt. Some of the background is, therefore, left unquilted. I hope you are getting some quilting done? You can find the free patterns for these and other blocks of this quilt by clicking on the ‘ Dreamcatcher Round the Year’ page above! A `Trip Around the World’ quilt in the colours of autumn, made for my mother in 2009-2010. The white sashing adds a twist to the traditional pattern! 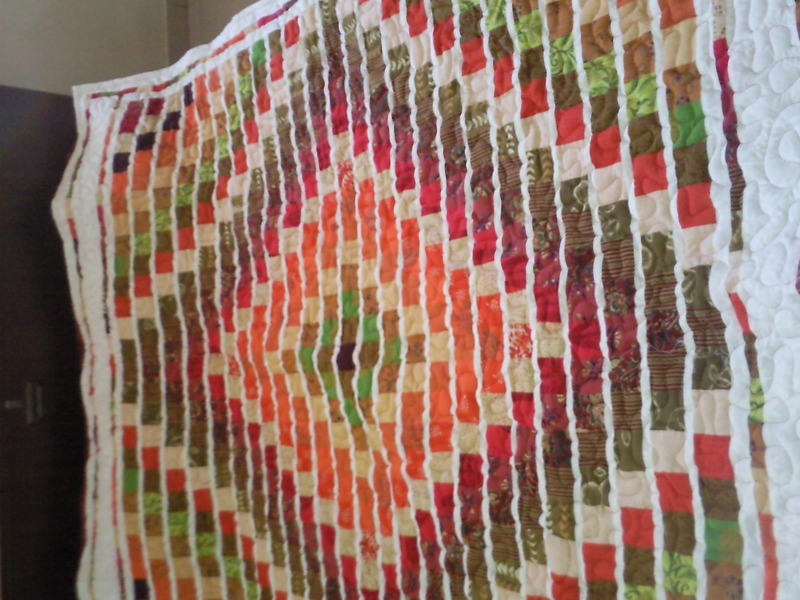 My second post of the day and another quilt from long ago! A quilt for my mother! This one is also from the Better Homes & Gardens Vol 4 of `Quilt Lovers’ Favorites’, just like the quilt for my son. This was made entirely from scraps of hand -block printed and handwoven fabrics, muslins and cambrics. The pattern is by Carla Malkiewich and used 2.5″ squares. I knew nothing about strip piecing when I made this quilt in 2009, so I cut nearly 700 squares individually, placed them as advised before joining them in rows. I tried black for the sashing strips, but decided I liked white better. The great bit about this pattern, which uses sashing strips to separate the pieced rows, is that you don’t need to match any points! The original pattern finished at 60.5″ x 72.5″ . I added extra borders on the shorter edges to make it longer and finish at 60.5″ x 86.5″. I had a local tailor quilt it for me. I had asked the tailor to leave the edges undone as I would do the binding myself. 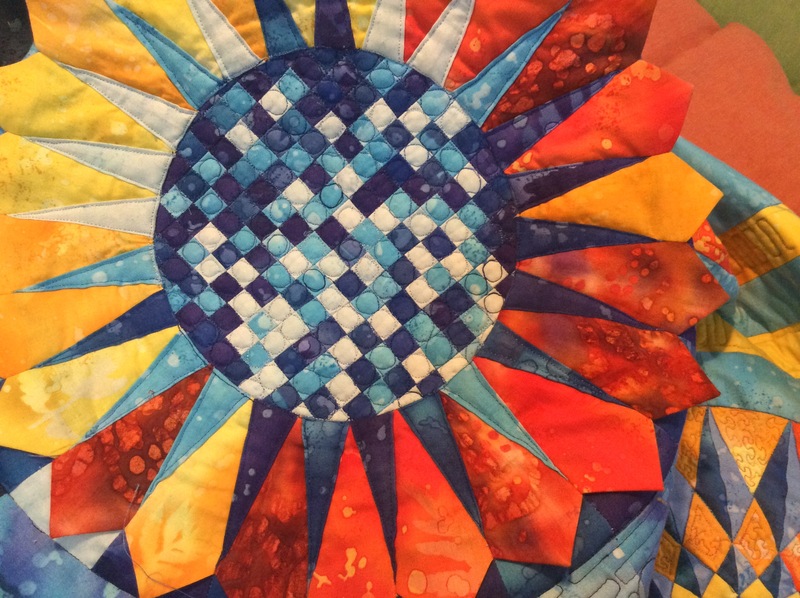 Instead he sewed them in and the final quilt finished at 56″ x 80″. 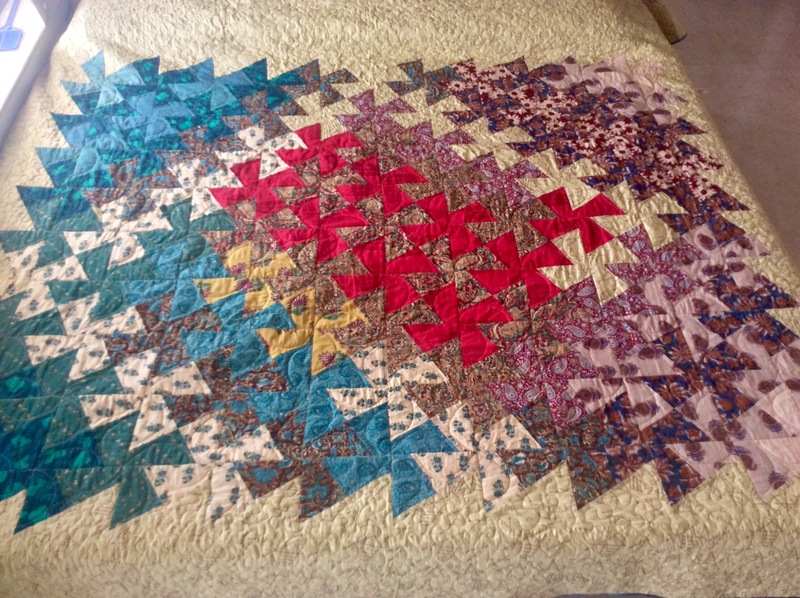 My mother did not like the length and I had to increase it by opening the shorter edges and adding rust coloured fabric, batting and backing, much as you would in a quilt-as-you-go project! Now it is a comfortable 90″ long and she is happy! My mother enjoys a nap , with the mid-morning sun streaming in from the window. Is she dreaming of a trip around the world, you suppose? Incidentally, this beautiful picture was taken on 10th March, 2012, exactly 4 years ago. Don’t you love the play of light and shadows in it? 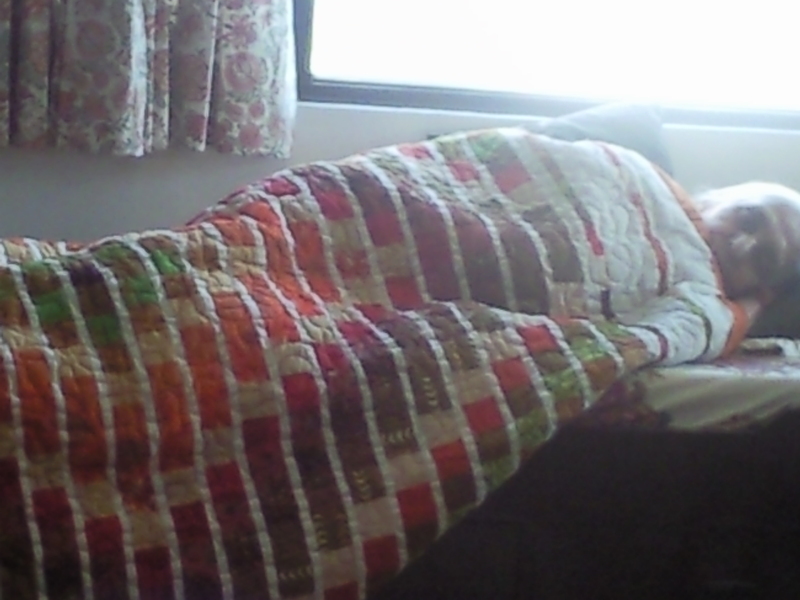 It makes me feel all warm and happy inside, seeing my mother snuggled inside the quilt her daughter made for her! 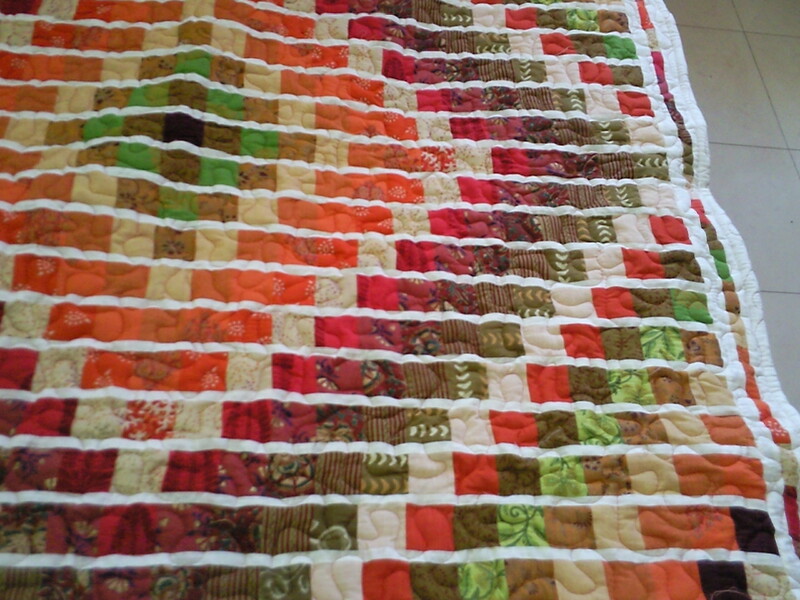 My first ever quilt was made for my son in 2009, using hand-dyed ‘Dabu’ fabrics. 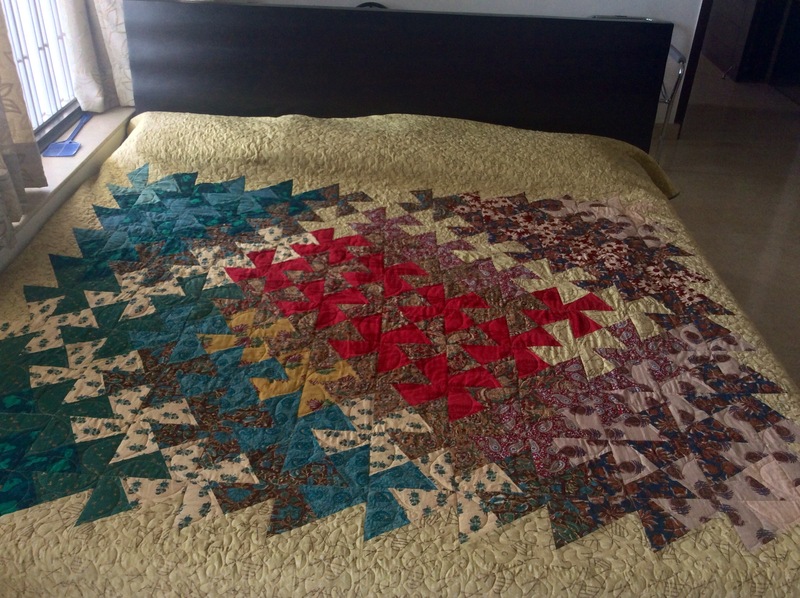 The pattern called “Twilight” from a BHG compilation of quilt patterns, alternated the friendship star with background `night’ blocks. It is hand quilted! I discovered today that I have not ever shared properly the first proper quilt I have made, using the three layers of top, batting and backing. A couple of pics have been shared here and there, but this quilt deserves its very own blogpost! So it is only proper that I should amend this. The pattern called ‘Twilight’ is by Leslie Beck at Fiber Mosaic and features in BHG’s Quilt Lovers’ Favorites Vol 4. The checkered border was added by me to increase the size. In 2008, I re-discovered quilting when visting the US – at Barnes and Noble. I bought two books, one of which was a Better Homes and Gardens compilation of Quilt Lovers’ Favorites. 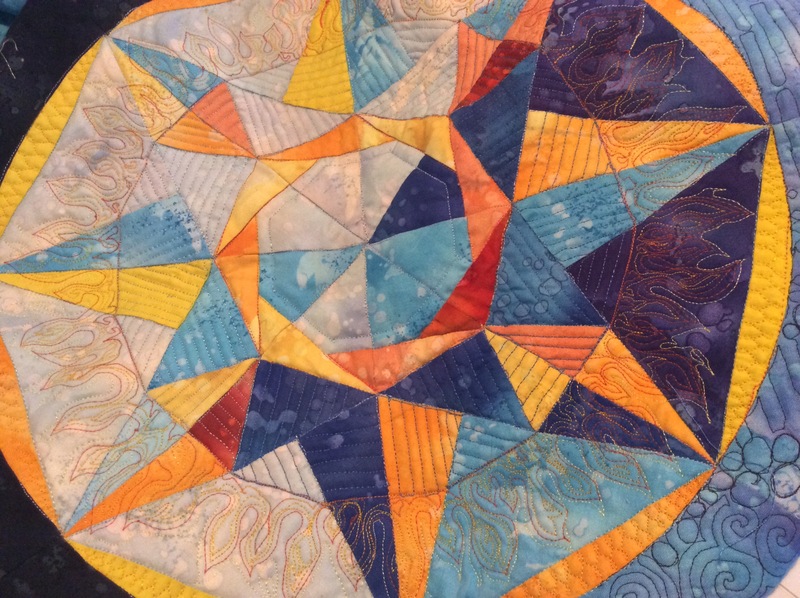 This quilt ‘Twilight’ was featured there. I chose this pattern because it was in my son’s favourite colour, blue, and indigo prints were easily available in my city. These are mainly muslins and cambrics, a couple of handwoven fabrics. All are hand-block or mud resist-dye printed, by a method called Dabu printing. These fabrics are all manually printed by local printers, using natural indigo by a mud-resist dyeing method called ‘Dabu printing’. I knew nothing about chain piecing or strip-piecing and had no idea whatsoever about short cut methods for piecing. Nine pieces to each block was a huge number for me and it took me almost two months to piece this. The blocks finished at 4.5″ and there were 124 of them to make! The checkered border was added to add width and length to the top for my six -foot plus tall son! 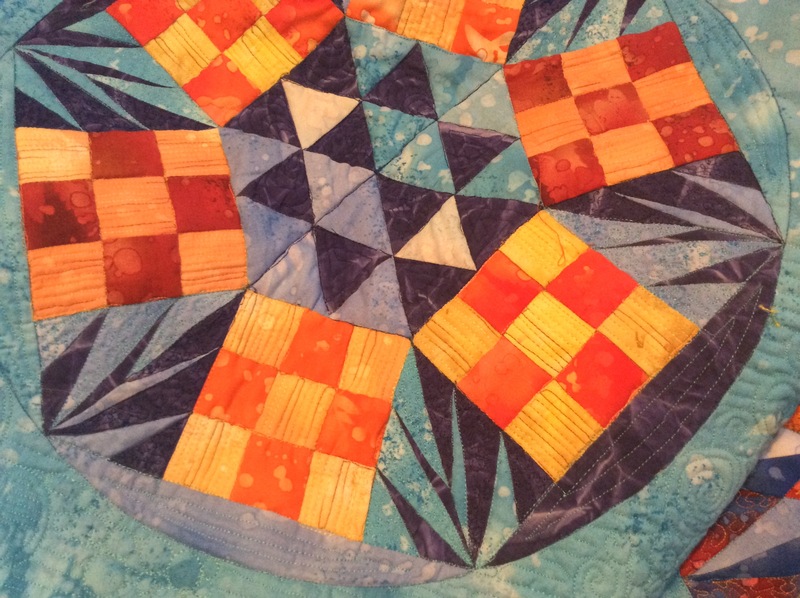 The squares in the border are 1.5″ finished. The quilt top finishes at 67″ x 95″, if I remember correctly! Do you know I have a tutorial for making a perfect basic four-patch square quilt block, similar to those used here? I wish I had known this earlier! This is the quilt top, finally ready to be quilted. I had no idea about batting either. The polyfibre batting used here is almost an inch thick. I knew nothing about hand quilting either. What I read and saw on the net was that the stitches were supposed to be 10 to an inch! Each stitch involved, therefore, pushing the needle down three layers, and pulling the entire thread down to the other side. Then the reverse, each time adjusting the shifting, slippery layers to ensure the stitch was just 1/10″ and in place! 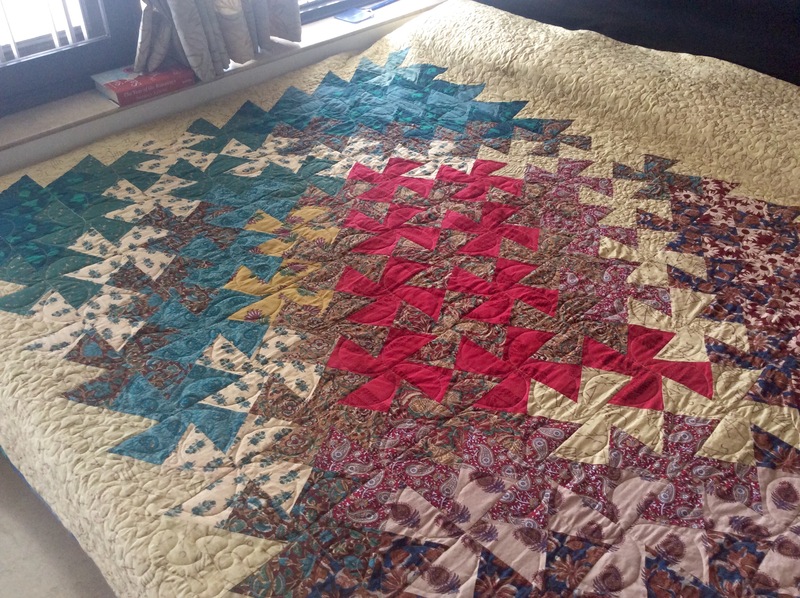 So it took me four months to hand quilt it. I quilted different sashiko patterns on all the blue squares, except the outermost 2 rows. The red and blue fabrics added some colour to the proceedings. A few pictures showing details…incidentally, the pictures of the completed quilt were taken exactly 7 years ago, to the date! 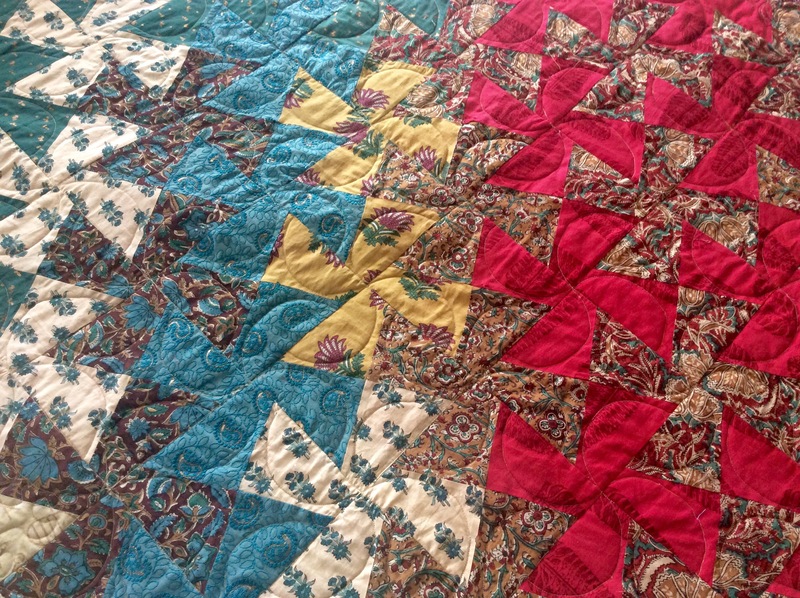 The centre of the quilt thread-basted and being quilted. A couple of pics of the completed quilt! All quilted and ready to travel to America! Okay, just one more picture! I love this quilt as does my son! What do you think of my first quilt? 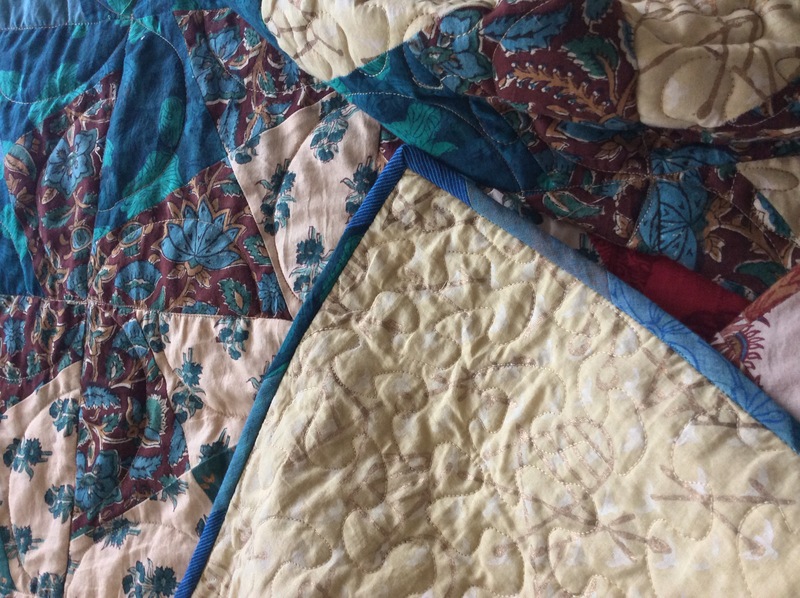 What was your first quilt like? 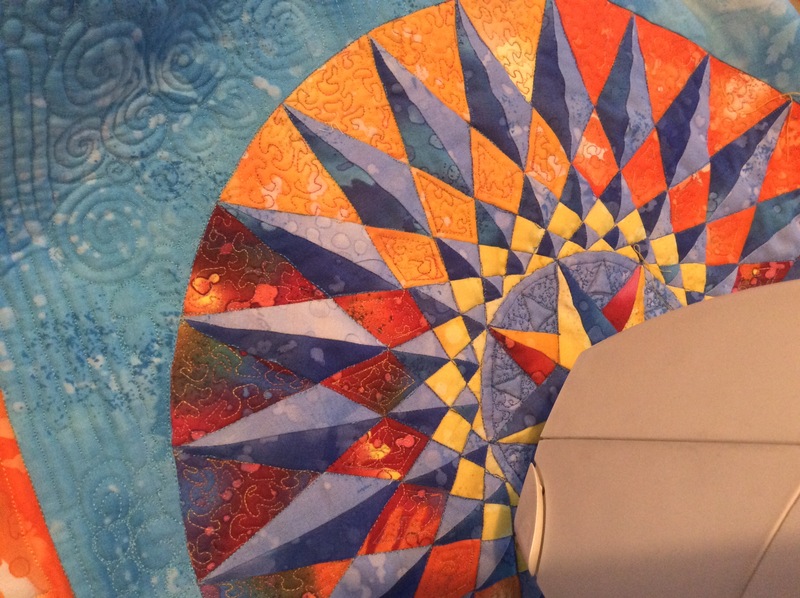 This is a long outstanding project – a UFO (unfinished object) in quilting lingo – finished! 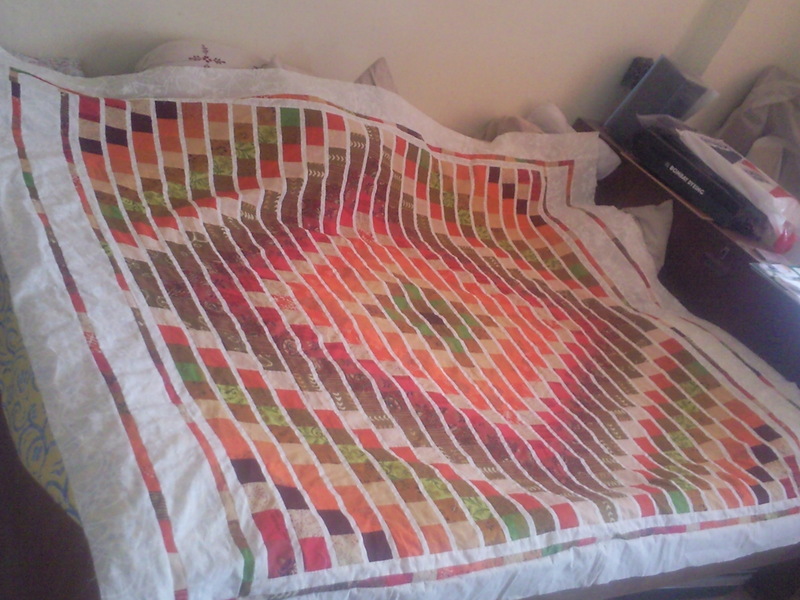 This 100″x110″ quilt is made up entirely from scraps of muslin and cambric left over from sewing my salwar-kameezes. Other than, of course, the border, for which I bought fabric separately. Most of these are hand-block prints; there are a couple which are hand-woven fabric and one which is hand-embroidered too! 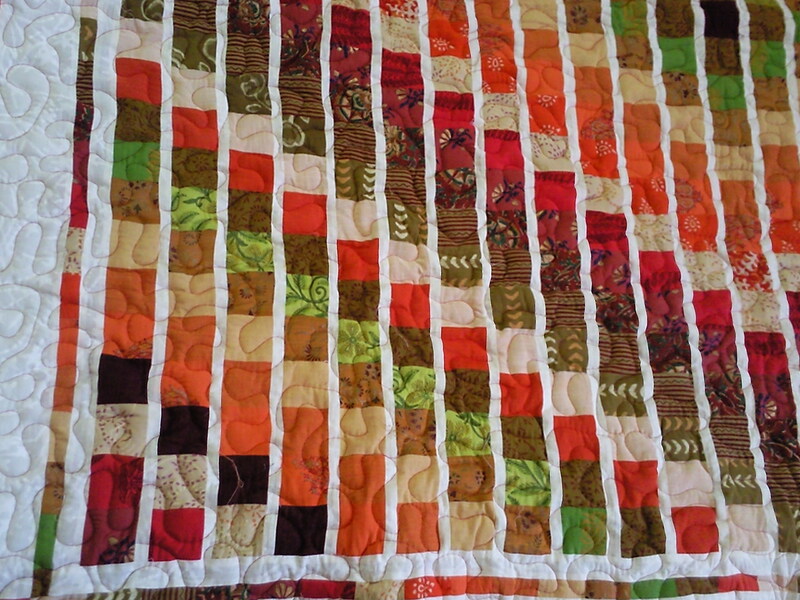 I used only leftover scraps from sewing my dresses (salwar-kameezes) to make this quilt – other than the border. This was an easy one to piece. I arranged and cut the squares, stacked them up row wise and cut across them, using a cardboard template. I don’t exactly remember what I did ( it was five years ago! ), but it involved slipping a piece from the top of one row to the row immediately below it…I must dig out that method and share it, perhaps! The ‘stack and whack’ method was used to cut the pieces. To quilt the blocks, I first used a cardboard template to draw the semi circles. This did not work very well, because this is such a huge quilt! By the time I would get to the blocks, the lines would get rubbed off! I finally held the cardboard template down in place and quilted around it! This seemed to be much easier than the hours it took to draw and re-draw the semi-circles. Made a thin cardboard template and sewed around it to get those perfect semi-circles. 1. Use only good quality thread. The amount of money you spend on it quite offsets the amount of time you need to deal with thread breakages and tension problems! 2. Deal with a thread breakage right then and there, burying off the offending threads before you bring up the new thread. Otherwise you face the prospect of having to deal with tangled threads. This is really the case where ‘a rip in time saves nine’! 3. I keep forgetting this, but when the machine starts behaving strangely or the thread tension starts going off, do check to see if the bobbin is running out of thread! Does it happen to you also that the lower thread tension needs easing just before the thread runs out? The bobbin thread sensor on my machine has gone off and I have had to do a lot of ripping because of this. 4. Never again such a huge quilt on my little Hasina! I will stick to quilt-as -you-go, wherever possible! After I ‘finished’ the quilt, I discovered unquilted portions, which I am not in a hurry to amend. I had also started quilting between the ‘petals’ of the 4-petaled ‘flower’, but I got bored! I had decided I would rip out those portions, but again, I am not doing that. Oh, I forgot to mention the binding! I did not have enough of any one fabric for the binding and was undecided which colour it should be! 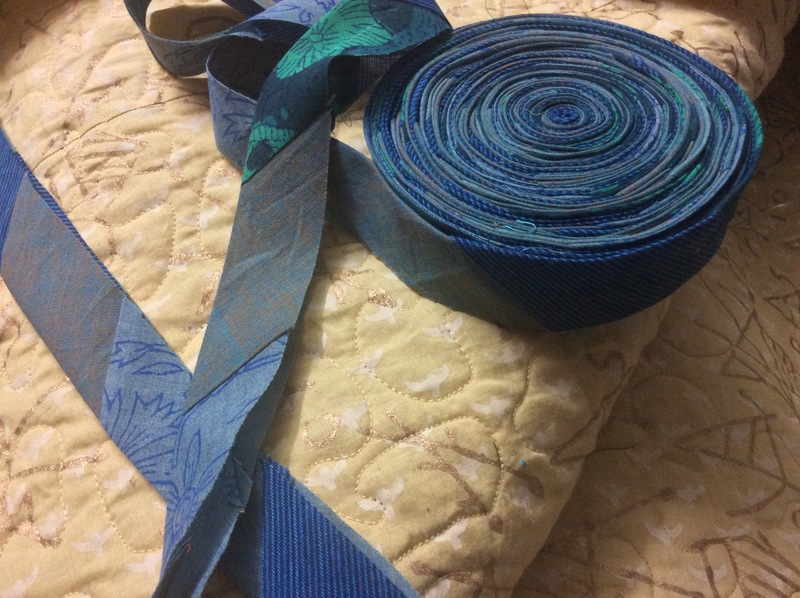 So, I made scrap binding joining all the scraps of teal and blue fabrics used in the quilt. I cut them into 2.5″ wide strips, joined them and cut them diagonally to get this! The scrappy bias binding ! The binding – took a long time to make, but worth it? So here is my dancing magic squares quilt, the first quilt that I am going to keep all for myself! Progress on Quilting the Dreamcatcher Round the Year! There is some progress on the first of the five (quilt-as-you-go) panels that will make up this quilt. Here is a look! I haven’t posted for a long time because I have worked only sporadically on the quilt. Today, I seem to be getting somewhere! Here are some pictures. The block Sapphire Fire is done! Block Twelve Dozens Squared is finished too! The Spiked Dresden needs a little quilting on the blue background under the ‘petals’, which will not be stitched down. The Spiked Dresden, Block Eight – I love this! The fourth block in this qayg ( quilt as you go) panel is the Mariner 24. Just the tiniest bit of quilting on the inner compass and we are done. Although, I am not quite sure if I like what I am doing there and have half a mind to rip it and do something else! Do you think i should do something different in the blue area in the inner compass? I just realized that this was every fourth block of the Block of the Month – 4th, 8th, 12th and 16th! Not by design, though! I hope I will be able to finish this panel in a couple of days; a lot of the background still remains to be done. What is everybody else doing? Happy quilting to you all! 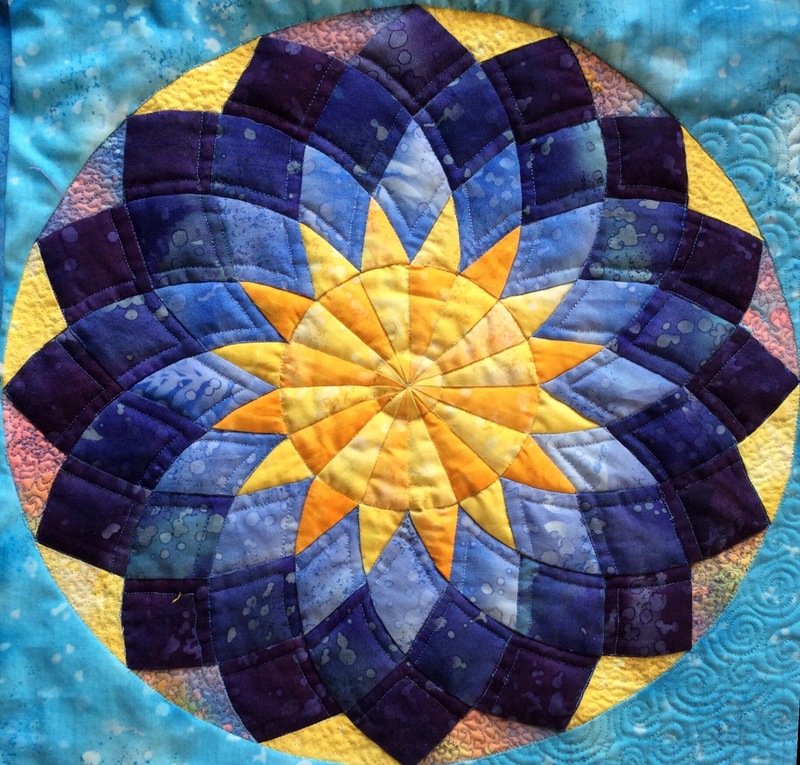 Author MadsPosted on March 2, 2016 Categories Patchwork of my life, Round the Year quiltTags Dreamcatcher Quilt, free motion quilting, quilting the Round the year quiltLeave a comment on Progress on Quilting the Dreamcatcher Round the Year!